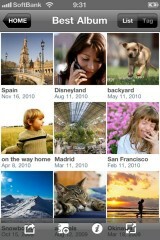 Best Album allows you to use Google Picasa on your iDevice. The user has full control over any number of Picasa accounts, with the options to view, edit, delete, or even email albums. You can also view, upload, move, save, or delete individual photos to/from your albums. The app allows you to view all Exif information, including location by way of a coordinate map. Sharing features are also available by email, SMS, Twitter, Facebook, and AirPrint. I found Best Album to be very useful, especially because you can upload any number of photos (and of any size) from your device to Google Picasa. The app even includes a helpful (but limited) set of edit functions to touch up photos that aren’t perfect. It is also worth noting that Best Albums provides a very convenient cache function in case you want to be able to view your photos offline. While many of us want to keep our precious hard drive space, some my might take advantage of that feature. SloPro is a video recording and editing app that allows you to view your recordings in various speeds. The concept of taking videos and slowing them down can be quite useful for not only entertainment purposes, but also for more educational purpose, such as instructional aids. SloPro allows you to slow down or accelerate the recordings to various speeds, which all looked very smooth on my 4S when I rendered the videos. Directions for rendering are given in the app itself and are very clear. There are some limitations to the free version, though. It lacks the ability to export to camera roll, export raw 60fps, remove watermarks, and email videos. All of these actions would be nice to have, but might not be required depending on your intentions for using the app. 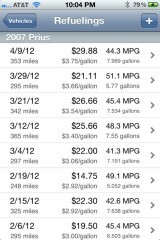 Mileage Keeper is a simple and straightforward tool for tracking your automobile’s fuel economy. Whenever you refuel, you simply enter your odometer reading and fuel amount at the pump (or from your receipt) and the app calculates the mileage (MPG, etc.) for you in a nice iOS table. You also have the option to provide the refueling cost, which Mileage Keeper will use to keep track of the price per gallon amount you are paying each time. It is worth noting that this app can be used in several different countries, as the mileage and currency is displayed in your local style. This app is not for the user who wants something aesthetically mind-blowing, but rather for someone who just wants a straightforward and free mileage tracker. One feature I really enjoy about Mileage Keeper is that provides options for not only partial fillings, but for a skipped refueling. You can also do this for any number of cars. Furthermore, I can see how this app would work quite well for company employees who are supposed to keep track of gas purchases.